An exhibition and Food Event at the exclusive Kitchen Manufacturer Dross & Schaffer in Munich. The identity reflects the playfulness of the objects, as well as the old traditions from ceramics. A combination of a slightly surreal illustration that plays on the origins of a teapot and a strange title set in Goudy Old Style with eccentric details and a traditional character against Akzidenz-Grotesk. We then added a loud pink (Pantone 805) to bring it center stage. This identity illustrates the contrasts of a subtle but highly crafted material such as porcelain and the loud food of a fast and modern Korean culture. 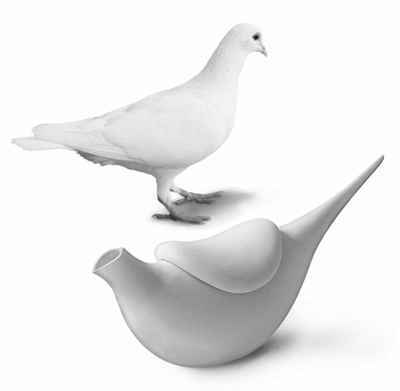 We chose a kettle from the exhibition items and combined it with a dove resembling the shape and elegance of the object. We chose Goudy for its traditional character and Akzidenz for its timelessness. 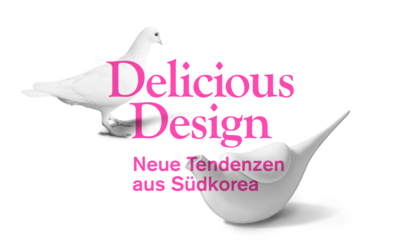 The exhibition “Delicious Design - New Tendencies from South Korea” showed 50 objects from Korean craftsmen and designers to highlight the playfulness of the table and food culture in South Korea. 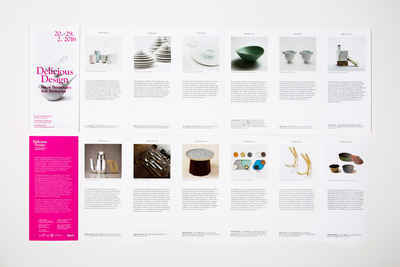 Fan fold brochure from the exhibition showing 1 object from each of the 12 designers with a short description and biography. A1 Poster for the exhibition and food event printed in black and Pantone 805.